I never realized what a difference even the smallest changes make, from baseboard trim to light fixtures. Getting all new furniture can really add up, but making a few updates to your lighting, decor, or even just throw pillows can go a long way! 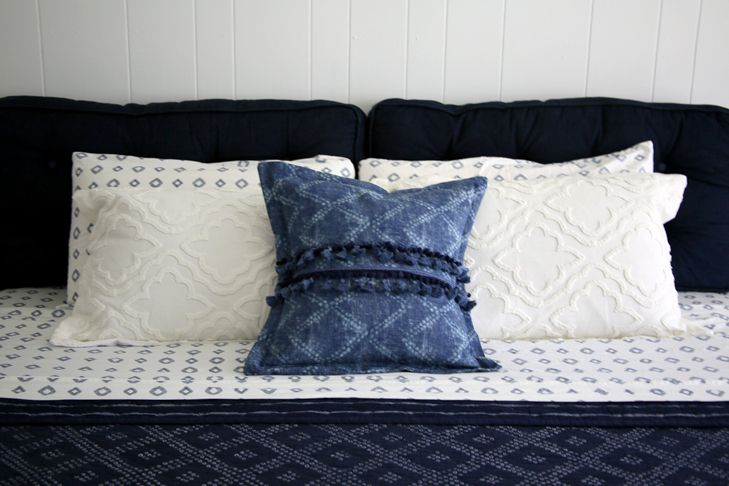 I love this striped pillow – how cute are the side tassels! Also this light fixture – we brought the honeycomb pattern into our new house in a few spots, and now I’m craving it everywhere. For more of a statement, I’m obsessed with this shell chandelier. I’m such a visual person which I’ve realized is one of the hardest things about the process for me when it comes to decorating. I have such a hard time deciding on different decor items without seeing them in person, but the turnaround time for furniture is so much longer than clothes (obviously) so it’s not an ideal process. I ended up putting together mood boards with all the pieces I was thinking of for the room to see how different pieces would come together. It might seem like a time-consuming step, but taking a few minutes to help myself visualize a space ends up saving a massive headaches in the long run. This is one of those things I’ve learned in fashion that I found myself adopting in home decor, too. If you’ve followed my for a while, you’ve seen a gradual transition towards neutrals. Colors are always going in and out of season, but when it comes to those investment pieces, its the neutrals that will be truly timeless. I love bringing color in with pretty accents that are easier and more affordable to swap out occasionally as your taste changes. These rattan stools are one of those neutral pieces you’ll love forever (also these!) and I love this console table. Also obsessed with these dip-dyed stools! Such a great balance of neutral and color and they are under $100. Sale ends soon, but just a reminder to get 20% off with code INPSO Also, I would love any other tips you guys have for decorating! The post 3 Lessons I’ve Learned Decorating Our Home appeared first on Hello Fashion. I had no idea when starting to decorate and furnish how many little details go into it! Picking even the smaller things like console tables to coordinate with everything else in the space turned into a rabbit hole of exploring. We are working with an interior designer (@erinhansendesign) which helps a TON! But I’ve come to love looking at other pieces even after we finalize our own I get so many questions on where things are from that I thought I would share some splurge vs save inspiration as I find it along the way. We just ordered this console table for my entry way and I can’t wait for it to get here! The one thing I have realized is that furniture takes WAY longer than clothes I wish we could get everything in a couple days like everything else I’m also obsessed with this rattan one (this save option is such a steal under $200!)! We have got a lot of cute textured pieces for our home, so I think a console table is a great place to bring that in. Which console table below is your favorite? What spaces do you want me to share more inspo on? The post Hello Fashion at Home: Splurge // Save on Console Tables appeared first on Hello Fashion. I have so much of our house still to decorate!! So this week I wanted to share all this cute home inspo under $100!!! So many good finds! Especially loving this blush pink rug & basket. The basket is only $35!! The wood beads are a great way to add a little warmth to your decor. They look great inside a bowl on a console or coffee table and they are under $10! Hope you all are having a great week Happy Valentine’s Day!! The post Home Decor Favorites Under $100 appeared first on Hello Fashion. How cute are these pillows I just ordered? Use code CYBERMSM for extra discount. Also love this tray and its extra 25% off through today only code: BIGDAY. The post Cyber Monday – Favorites for the Home appeared first on Hello Fashion. While summer may be officially on it’s way out, there are some brands that can bring us back to memories of warm evenings spent eating al fresco along the seaside and Cabana Luxe is one of them. Going into their fifth year of business, owner and lead designer, Helen White, continues her quest to make luxury home products – especially tablewear – that you simply can’t find anywhere else. From hand-painted limoges plates to embroidered linens and colorful Murano glassware, always showing off that at its core, Cabana displays how their partnerships with European artisans, modernize and update old-world techniques, creating these exclusive ‘post-luxury’ products for the design-minded individual. The brand was originally launched in Capri in 2014 and quickly migrated to St. Moritz and now have a vitrine at The Ritz hotel in Paris while creating pop-ups in equally fabulous places like The Hamptons. They’ve also expanded beyond homeware into beautifully embroidered caftans and dresses and handcrafted jewelry. See some of our favorite pieces along with their fabulous variety of one of a kind pieces in the slideshow above! Now all our flooring is covered while they work on the other parts of the house. This is our living room (and partial dining room) view. One of the things we really stressed when we were designing this house was we wanted as much natural light as possible. Cody and I both love windows and the energy of a bright space so we maximized as much windows as possible. Last weekend was the first time I’ve noticed this angle, and I’m so in love with all the windows you see from here. They are about 75% done with cabinets. These are the lockers for the kids backpacks and coats when you come in from the garage. That is one of my biggest pet peeves right now we have a really small closet at our rental, and when the kids come home from school everything just gets thrown at our entry way especially during the winter with coats, so I am really excited about these with lots of storage so we don’t have that mess. Downstairs family room – before we added the tile benches. These tile benches are one of my favorite details of the whole house! They look down to the sports court area on the lower level. Im so excited to put cute pillows on them! A bunch of you were asking about tile details. They are handmade ceramic tiles. I got them here. There are so many details I would have never noticed before building, but now I get excited about every little thing. I love all the lines with the window surroundings and trim. A peak at our shower flooring next to our wood tile floors. How pretty are these little 1×1’s from Bedrosians. My flash kind of made the color blues seem really different in the pic above (with flash) and below (no flash) but I wanted a pop of color somewhere, and love this tile we’re putting down in our laundry room. It’s the prettiest blue! So right now we are hoping, REALLY HOPING, to make it in before Christmas. Cody thinks it will be Valentines Day and I’m praying for Christmas haha so we will see. Fingers Crossed! I’m REALLY excited for the space and what it will be, but I also don’t want to sugar coat it and act like it hasn’t been stressful, that Cody and I haven’t fought about decisions along the way, or had hiccups in this whole process. I think honestly I just had no idea how many little decisions went into this process. Also I am a crazy detail oriented person when it comes to even the smallest details on how I want something to look. 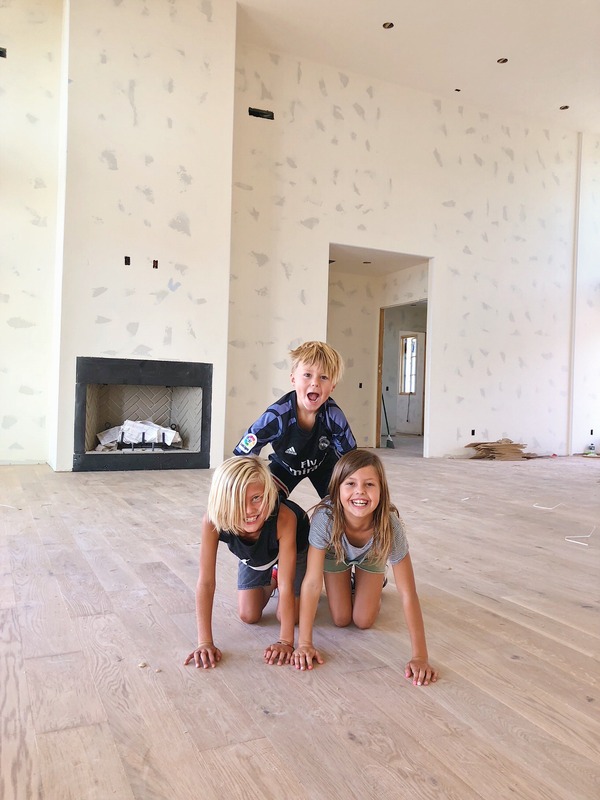 If I could give any piece of advice I would say if you have never built a home (this is our first time and we had zero experience) and are doing everything 100% custom, realize it is 100% a part time to full time job. I think if we were to do it over, I almost wish we would have done one of the subdivision homes where they only give you limited amount of options so I could learn the process for my first time, and then do 100% custom the second time around where I know more about the details and how long things take. I know we will love the home so much once its done. I want it to be a place the kids have so many memories of and consider the “house they grew up in”. My family was in town a couple weeks ago and my parents pulled up the house I grew up in in elementary/middle school in Washington, and I had soooo many memories. I can’t wait to make this that special place with the kids. I’ll be better at posting more updates a long the way now as we reach the home stretch – is there anything else specific you guys want to see? The post House Update appeared first on Hello Fashion. Let’s be honest – not everyone has the space for a 10’ tree. Try decorating your windows! 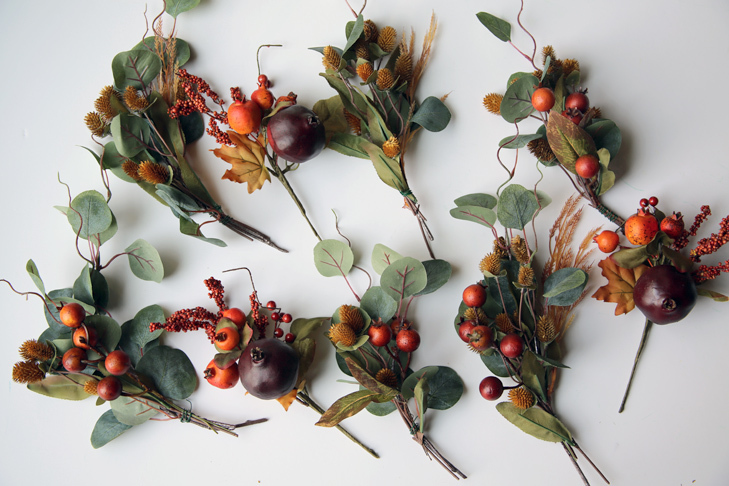 Pick up some garland (I love real fresh pine garlands, but the faux stuff works too!) and attach it around your window frames. Let it drape down to the floor. Dress it up with lights and strategically placed ornaments. Stick with a color palette so it feels classy and cohesive. You can loosely twist a strand of twine around the garland for added texture. It’ll make for such a cozy atmosphere, and it’s so welcoming as you or guests see the glowing lights from the outside. The same goes for any open doorways or entryways leading into main spaces. If you have leftover garland, drape it over a console, or any side table and nestle some ornaments in there. This is a great place for those family heirloom ornaments that don’t fit with your main color palette, but you want to showcase them in some way. Pull out those hurricane candles, group them together in varying heights, curve some olive branch sprigs inside around the base, and place them on the floor of each main room. If you have little ones or pets, opt for the faux flickering ones. Don’t have enough candles? Fill one with leftover ornaments and place a strand of battery-operated LED string lights in there with them. You can gather some gourds and pumpkins around the hurricanes, or place a few wrapped presents next to these if you don’t have a tree to set them under. I’m a big fan of using 2-3 coordinating wrapping papers/ribbons, and sticking to that for all of my presents. One should be a solid color and the other 2 can be a pattern of some sort if you like. Keeping with the same wrapping papers throughout makes for a pulled together look as opposed to a mismatched, busy and cluttered space. In theory this sounds strange, but I love overlapping a gallery wall with a gigantic wreath. Pick a spot about 6’ off the ground (preferably centered on the wall), hammer in a nail or drill in a screw, and hang a wreath. You can buy one or you can scour Pinterest for the millions of ways to create your own. I love the asymmetrical wreaths with twisted olive branches and flowers. The overlap of textures will be so pretty, and what better backdrop than a strategically planned gallery wall? Don’t forget the bow! Do you always have way too much Italian Parsley left over? I love using greens to dress up the kitchen and dining room when friends or family come over for the holidays. Give each person their own little bouquet! Grab some small glass jars, add a little water and place a few sprigs in each one. Your table will smell great, and the pop of green will feel so fresh and festive. One of the things I love doing with the change in seasons is swapping out the faux floral wreaths I have in my home and on my front door. I made this one a while back and never got around to blogging about it. Today’s the day! If you saw my wildflower wreath I posted this summer, these instructions are the same! Although I love bright foliage on the trees, I tend to go for more harvest tones for my wreath materials. 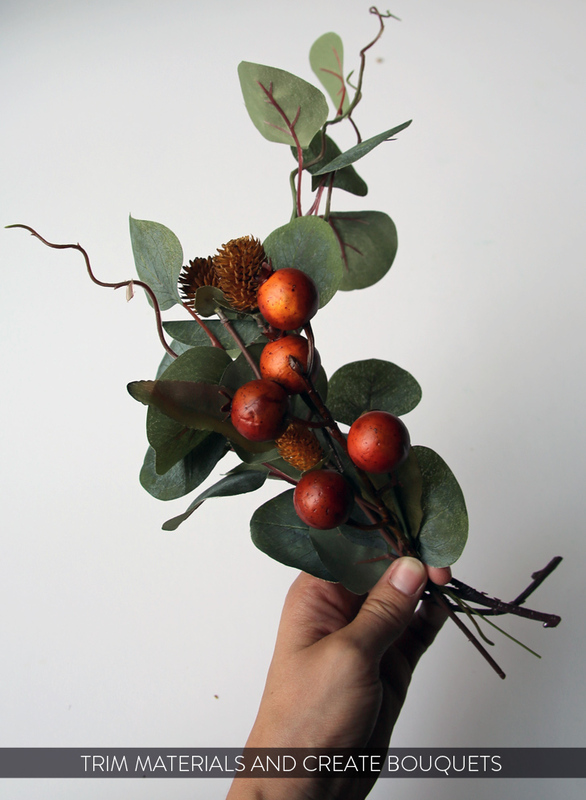 I saw these groupings of what look like maybe persimmons and small pomegranates and supplemented it with some faux eucalyptus. I like to cut the larger groupings down into smaller stems so I can rearrange them into little bouquets before I place them on the base. 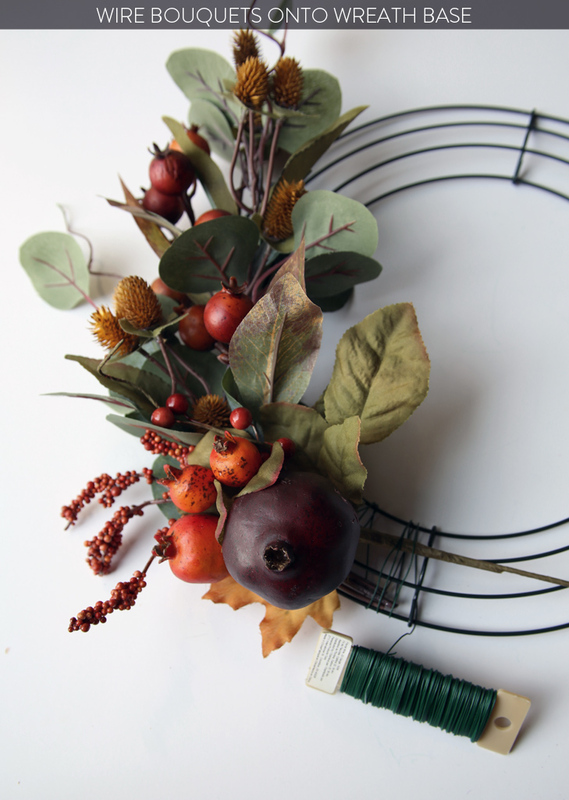 To ensure the foliage is evenly spread through the wreath, I divide my materials and make little bundles that I will wire on next! Using your florist wire, start wrapping on the small bouquets, layering subsequent bundles slightly over to cover wire. Continue around entire base until your wreath is complete! Read the full post Latest In Dream Kitchen Design which appeared first on Snob Essentials. Model turned landscape designer, Lily Kwong, has been busy beautifying spaces all over the country (most recently working with St-Germain turning NYC’s The High Line and LA’s Houdini Estate into a floral wonderland). She has been creating works of art and transforming areas utilizing thousands of blooms and greenery and it’s here she finds her happy place. With such a dramatic transfer of career and finding success in such different worlds of creativity, we were eager to pick this floral architect’s brain to get the low-down on her new career as well as get some tips from the expert on how you can transfer her grand designs for your own at-home soiree’s. Have you always been intrigued by landscape design? Where did your love for this world stem from? What inspires you? Definitely. Reconnecting with plants and nature has cracked open my life. Getting my hands in the dirt, exploring organic beauty, and designing in harmony with nature has reconnected me with my creativity and my community. Working with plant life has taught me patience, compassion, mindfulness – all those juicy life lessons. It satisfies all the dimensions of my personality: I get to do research, draw, travel, get cerebral, get physical, be outside, be chained to a computer, work with big teams, collaborate with other artists. At the end of the day what I enjoy most about this field is I know I’m working towards a greater mission of creating a more beautiful, sustainable future. Land Art truly connects with me. I’ve done some long stretches on the road in the past year to see specific works: Robert Smithson’s Spiral Jetty, Nancy Holt’s Sun Tunnels, the Turrell skyspaces “Twilight Epiphany” and “The Color Inside” in Texas, a stretch in Marfa to see Donald Judd’s work, among others. What was the moment you realized you wanted to turn a different direction in your career? I graduated with a degree in Urban Studies from Columbia University, and my first job out of school in 2012 was working as a Project Director for an urban design firm based in Miami. I was supposed to be writing research documents, overseeing operations and managing Clients. Instead I kept gravitating towards the horticulturalists and botanists the firm collaborated with, and was constantly sneaking out of the office to visit nurseries and Fairchild Botanical Garden. As soon as I reconnected with plants, I reconnected with myself. Being outside, getting in the dirt, and designing in harmony with nature completely unleashed my creativity. I knew I had found my path. In 2015, I spearheaded a project with American Forests’ reforestation program and sustainable brand, Amour Vert, to plant 100,000 trees across North America. What are some tips you can give to people to create a special event in or outside their own homes. Organize a dinner with a purpose! I love building community with old and new friends – over a home-cooked meal, organize a volunteer contingent for the Lower Eastside Girls Club or a non-profit in your neighborhood or host an event that raises money for Planned Parenthood or Emily’s List. No garden soiree is complete without a simple and refreshing cocktail in hand. Personally, I love the signature – St-Germain Cocktail – made with St-Germain elderflower liqueur, Champagne, and sparkling water over ice with a lemon twist. They have a beautiful carafe that can serve up to six people at a time, and can double as a floral vase. I designed a floral runner to celebrate the Piece & Co. X Banana Republic dinner at Public Hotels just days after breaking down the High Line installation. The 20+ feet of florals were composed of peonies, roses, ferns, lilies and baby’s breath. People are used to bouquets as table centerpieces, but a floral wreath adds a visual interest and magic to a table setting. I collaborated with Botanica Inc. on all the florals for my recent installations. Lily in front of the step and repeat at the St-Germain event on The High Line in NYC. Do you have a favorite project you’ve worked on? If so, why? Maison St-Germain is at the top of the list. The High Line has always deeply inspired me – it was a big part of why I wanted to study urban planning in the first place. I used the existing industrial architecture of the space to inform the layout of our labyrinth, which worked perfectly with the linear form of the High Line. I drew from St-Germain’s French roots and designed my interpretation of a 16th-century topiary maze. The snaking white line of flowers that ran through the maze was inspired by the Land Art I’ve seen in the past year, and visualizes the breathtaking fact that each bottle of St-Germain consists of 1,000 delicate elderflowers, that are handpicked once a year in Europe. For the LA debut, which took place on Aug 2nd at the Houdini Estate in the Hollywood Hills, we created a “Light Maison”. We constructed a 2,500 square foot house made out of neon lights on the main lawn in a traditional chateau style as a nod to St-Germain’s French roots. I was inspired by the Calder show currently at the Whitney Museum, and I’ve collaborated with renowned florist Jeff Leatham to install hanging orchids that capture the feeling of the sculptor’s famous mobiles. It’s all very exciting. You’ve done so many impressive events. What have you learned from them and what do you look to accomplish in your future of landscape designing? As designers I feel that we have a responsibility to help restore ecosystem where we can. Recently, I’ve been commissioned to create botanical art installations, in which case I focus on shocking people into re-connecting with the beauty of nature. In my work I find so many people are landscape blind – we’re so disconnected from nature as a culture that it becomes difficult to see the beauty of a single flower. I like working at a large-scale and confronting people with the natural world or an environmental idea, which I believe can translate into environmental stewardship down the road. For example, I recently designed and built a 5,000 square foot interior garden for the pop-up museum in downtown LA, The 14th Factory. The garden is just turf, but the topography is modeled after the landing site of the Apollo 14 mission to the moon. It was my response to the threat of climate change. I wanted to reveal the absurdity of the argument that we can occupy other planets in lieu of saving this beautiful planet we live on today. At the end of the day what I enjoy most about this field is I know I’m working towards a greater mission of creating a more beautiful, sustainable future. What aspects from your modeling career do you feel you’ve taken from and applied to within this new career (if any)? I use landscape and plant life as a vehicle to connect with other art forms, and often draw on my background in fashion for my installations. In this case, for Maison St-Germain’s NYC debut, I saw an opportunity to layer the maze with dance and performance. I partnered with artistic director Mafalda Millies, whose piece I fell in love with at Mana Contemporary this Winter. Based on my planting palette, she developed custom, hand-made costumes with fabricators Simone Duff and Jon Can Coskunses. The-Solar-Do-Nothing-Dance featured choreography by Nathan Mitchell, who most recently creative directed film projects and installations for McQ and appeared in Frank Ocean’s video for Nikes. In honor of the fact the Maison St-Germain debut took place on the summer solstice, we based the performance on an Eames invention that was one of the first devices to convert solar energy to electricity. There’s so much cross-pollination between industries today, and I love that my non-traditional background gives me a unique approach to landscape work. 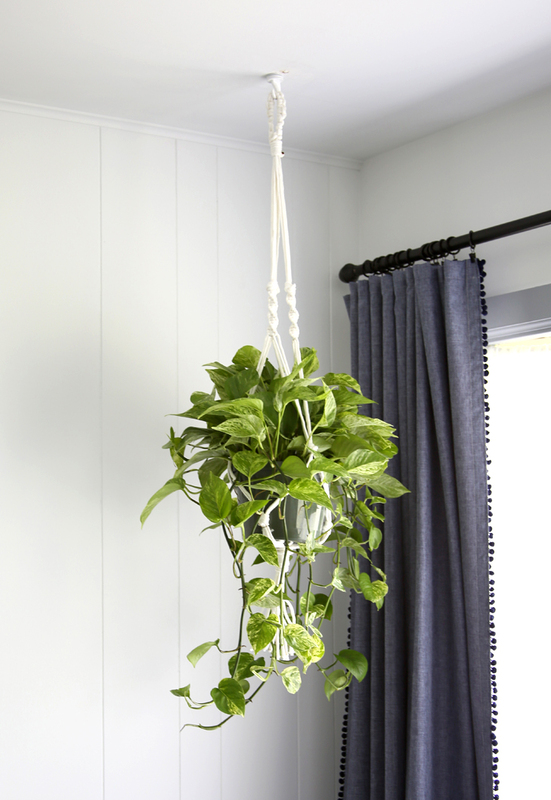 Ever since posting my budget friendly master bedroom makeover, I’ve had quite a few requests for a DIY on how I did my macrame plant hanger (shown above!) Truth be told, there are already loads of great step-by-step guides out there, so I’ve picked the best and linked to them below! And as an aside, I feel like there used to be so much link love in the blog world back in the day and I want to support other creative people! If you’re looking for something ready made, I suggest searching etsy! I’ve also rounded up some of my top picks below! Here’s to indoor hanging plants! May your home be full of them! 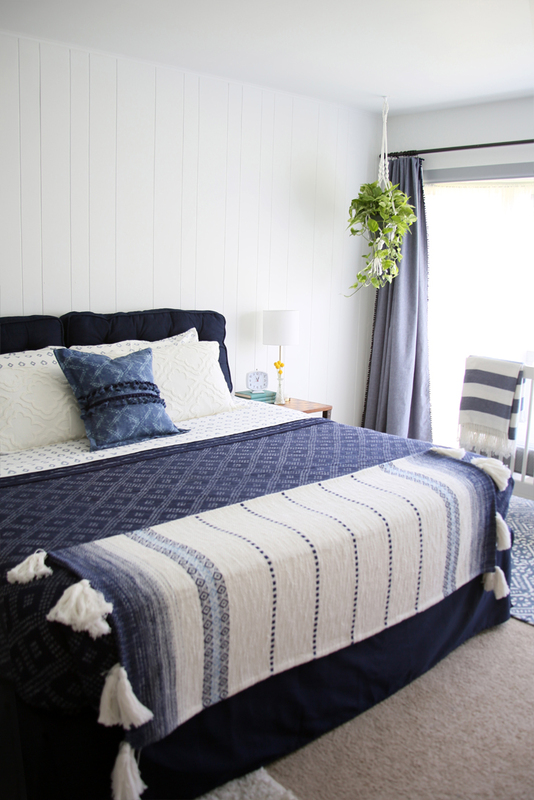 I’m so excited to show you my master bedroom makeover using second hand, self made and pieces bought on sale. It took me a week to pull everything together, including three coats of new wall paint, repainted trim and the ceiling. Phew. It was a lot of work, but fun work. Come on over and have a look! 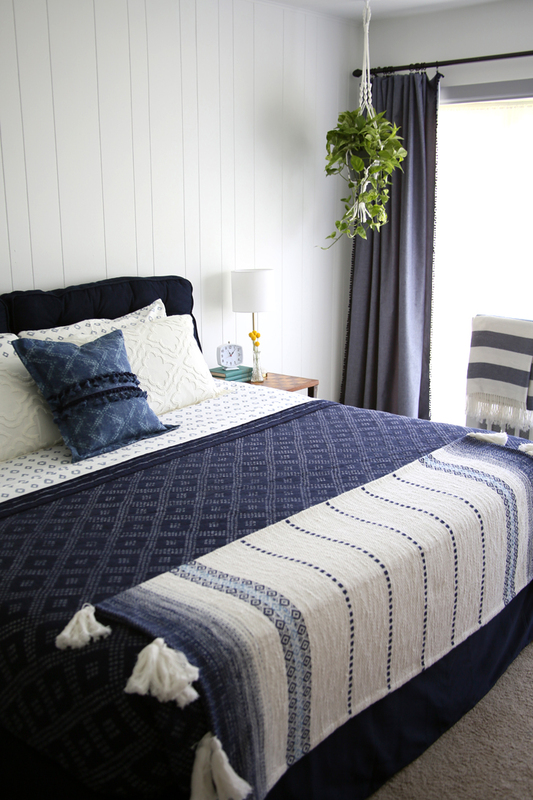 I knew I needed to do this bedroom update on a budget, and that meant keeping our king sized quilt from our old home (still available at Target). To give the look of a headboard, I re-used the cushion backs from our old couch that I recovered last year (the sofa itself was trashed by the cats). I gave them a good steam clean using my handy Little Green Machine and tucked them in next to the wall. I treated myself to a new set of sheets (bought on sale) and fabric for the decorative pillows, which I made myself. The quatrefoil off white fabric was pricey, but I scored it at 50% off and was able to make two shams for around $30 (I used a plain fabric for the back). For the decorative throw pillow I bought ¾ of a yard which was plenty for a 20×20″ pillow. For the trim I used what I had on hand leftover from other projects (like the curtains… see more on those below). I tried making the bed without a bed skirt, but decided to return a few things so I could buy this one (same as Felix’s room but in a king size). I tucked in the sheets to give the bed a crisp final look and it made such a huge difference over the way I had made it before (here’s a comparison photo). Lastly, I laid a funky woven blanket with tassels over the end of the bed, which I picked up at Marshall’s for $17 a while back. On my table, I have a new lamp and alarm clock (trying to keep the phone out of the bedroom) along with some vintage homekeeping books I got at a garage sale. The little vase is from Goodwill and filled with faux billy balls. 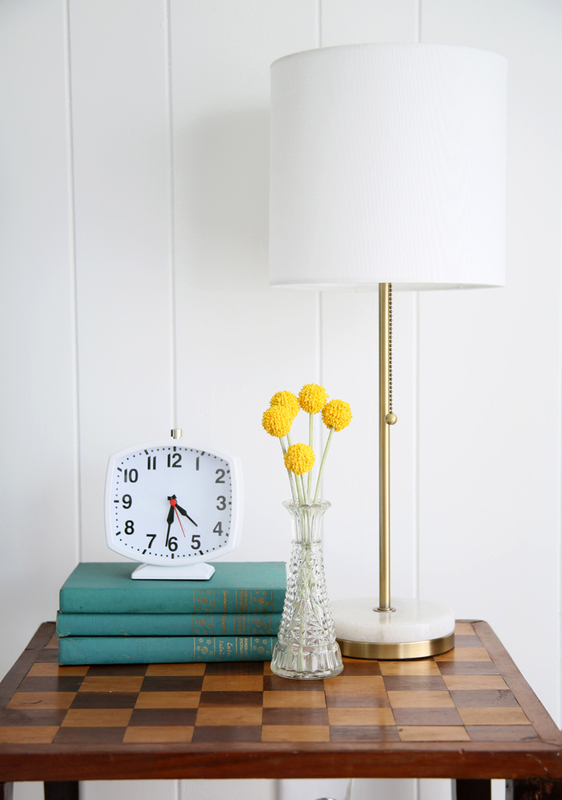 On Adam’s table is a matching lamp, another thrifted vase and a garage sale green catchall for his watch/change/cards at the end of the day. On the high dresser is the Jasmine, two family photos and more of those encyclopedias. The mirror was found upstairs in another bedroom, so I borrowed it for our room! 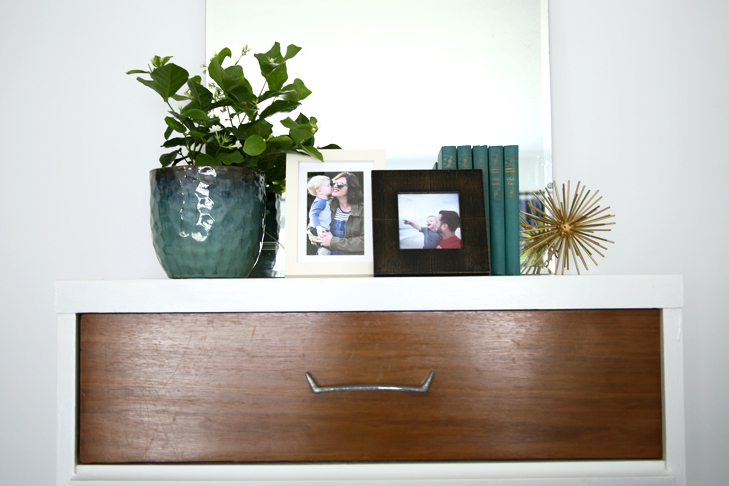 For the low dresser, I used a lamp from our old living room, the snake plant and another photo. 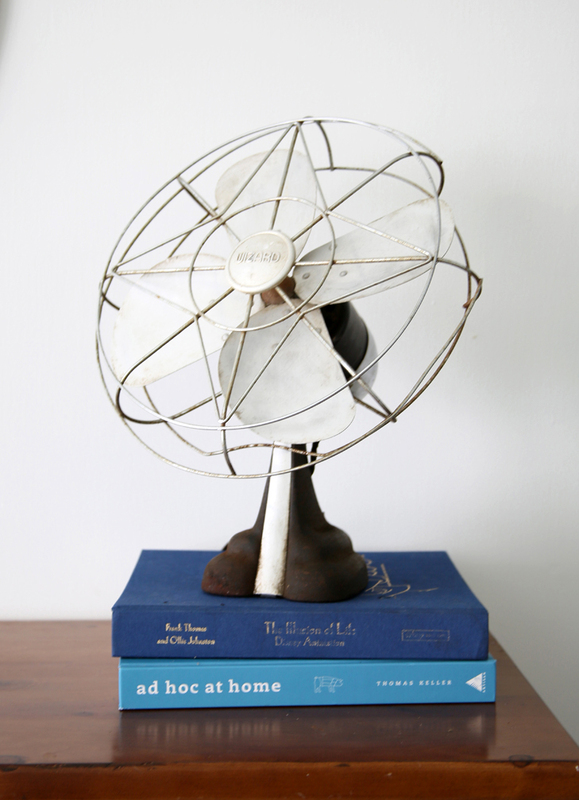 On the other end is a vintage fan (it works!) I got at a garage sale over some nice books. 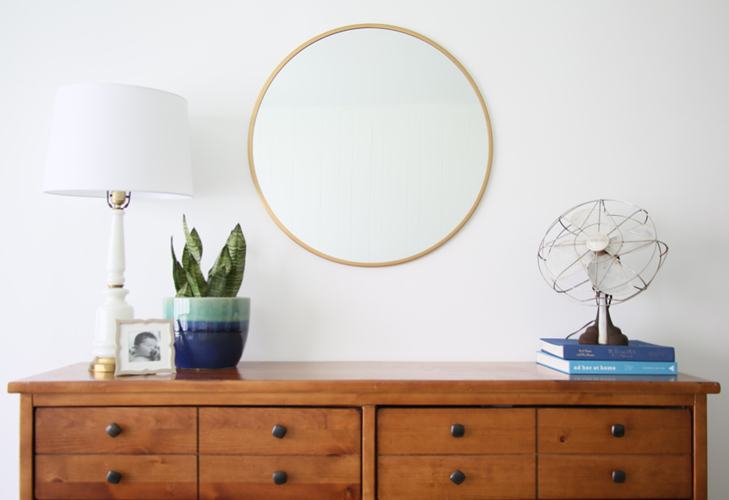 The circular mirror also used to be in our living room. I used old rugs (blue here and cream here) on each side of the room to save a little money on buying a large rug or re-carpeting the room (which we may do someday!) This room will eventually become Bea’s when we renovate the upstairs, so we’ll hold off on that for now. I’ve really been drawn to houseplants since moving here! I created a macrame hanger out of clothesline for the Pothos in the corner and also have a snake plant on one dresser and a Jasmine on the other. Although north facing, we get a lot of light through our big windows! Both dressers and side tables are second hand. Mine (with the clock) was a hallway table in our old house and is an antique. Adam’s side table was a score from Goodwill a month or so ago. The tall dresser is MCM that we had in our old bedroom and the lower dresser was something I picked up off of craigslist during move out week at IU. Bea doesn’t use her crib much (we co-sleep) but sometimes it’s a great place for a nap or a safe place to put her while I do this or that. Both it and the sheet are from Felix’s old nursery. The blanket used to be in our living room and is from Target. 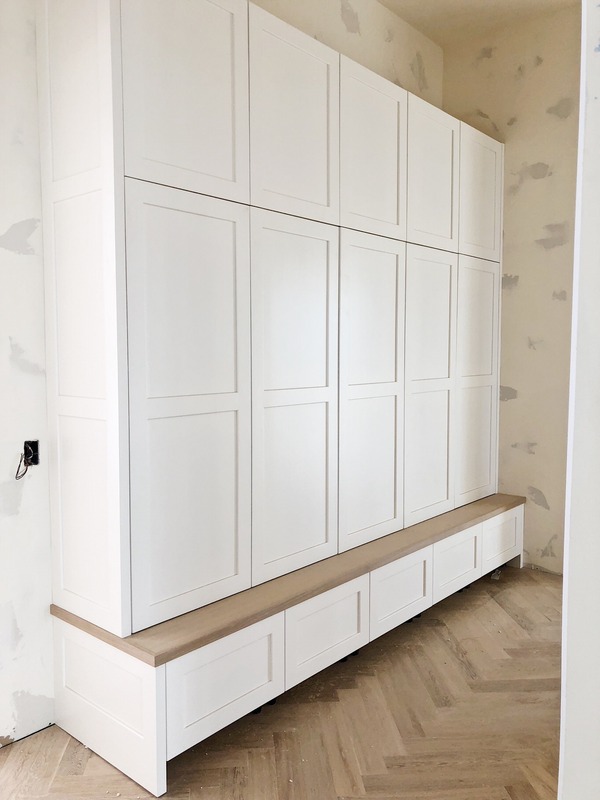 This room was originally a darker shade of brown so it took three coats of Wedding Veil by Benjamin Moore, filled in Valspar flat paint to cover it. It’s a very light gray that reads white in the room (and one shade lighter than my bathroom and hallway). The trim is Gray Shower, also by Benjamin Moore and filled at Lowes in Valspar satin. I love the way the new doors look repainted! I’ve never done a darker trim, but the end look is great! So that’s my master bedroom! It took me a full week of working after bedtime and a bunch of nap times to complete it, but it feels like a fancy hotel to me! I love it! With memorial day weekend around the corner, it’s about to be the start of summer providing a new season of bbq’s, outdoor soiree’s, and vacations. And while some people play the role of hostess with the mostest, many of us make up the attendees side of things, needing and seeking that perfect hostess gift to treat the people who are treating us to an amazing occasion. Fortunately, thanks to Christofle, you’ll officially be someone’s favorite guest of all time. Shaking up the classic codes of table setting with their new concept line, MOOD, this 24-piece silver plated silverware set makes up the centerpiece intended for dinners and brunches on both the casual and formal end of the spectrum.